This stylish bar necklace is part of the Thomas Sabo Love Bridge collection and is a must-have accessory for the fashion conscious! 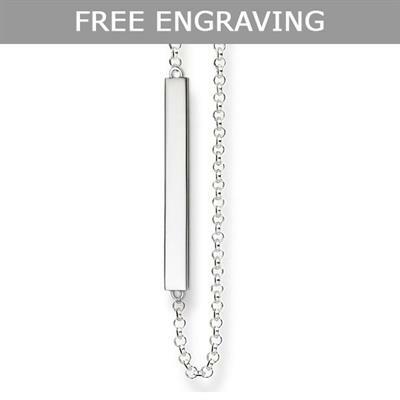 Wear the bar jewellery trend with this 925 Sterling Silver design with a short chain and an inset bar that can be personally engraved. This is a classic accessory perfect for everyday wear and ideal for layering with other chains. Let us know what you'd like to have engraved in the comments box at checkout. This style can fit up to 12 characters.